"Unleashed is a powerful, integrated platform that allows businesses real-time visibility of accurate inventory information. Providing precise tracking data on each and every item of stock helps businesses of all sizes reduce their costs and increase profits. Unleashed partners with a range of eCommerce, point of sales and accounting software to provide an end-to-end business management solution." If you find that your Unleashed order volume grows quickly, you will eventually end up bogged down with shipping and managing all of your orders every day. You will find that you need a more powerful shipping system, or even need to hire a third party fulfillment center so that you can concentrate on what all small business owners need to – marketing and selling your products. If this is the case, then you will need a way to integrate your Unleashed account with another piece of software. You will also need to sync your inventory and order tracking information so that your store is constantly updated. CartRover is designed to manage this process for you in a simple and inexpensive manner. CartRover was developed by programmers with years of experience in order management. It is pre-integrated with most popular shopping carts and marketplaces. It can be configured to automatically download orders, sync inventory and upload shipment tracking information back to Unleashed. If you are interested in using CartRover for your Unleashed integration, read up on how it works or you can take advantage of our free trial. 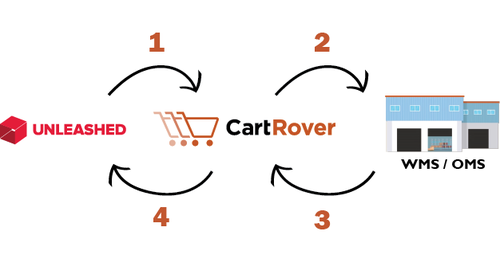 Let CartRover simplify your Ecommerce order flow!